Face-covering Islamic robes known as burqas and niqabs are to be banned from Holland’s colleges and universities, education minister Ronald Plasterk said on Wednesday. In September, Plasterk (Labour) said the ban will only apply to primary and secondary schools. Higher educational institutions would be able to take their own decisions because they work with adults, he said at the time. But now the minister has agreed to parliament’s wishes to extend the ban to higher education. ‘You must guarantee open communication… and be able to look one another in the eye. That also applies to higher education,’ Labour MP Margot Kraneveldt is reported as saying. Only one or two female students are thought to actually cover their faces while attending classes. An estimated 100 women in the Netherlands wear the all-encompassing Islamic garment. 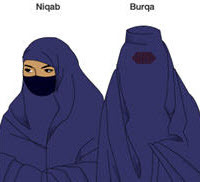 ‘The burqa and niqab are absurd, women-unfriendly and get in the way of integration,’ Plasterk is quoted as saying by website nu.nl on Wednesday. In February the cabinet said it would not bring in a general ban on burkas but did announce plans to forbid government civil servants from wearing them. At the time it said it expected local authorities to follow suit and extend the ban to council buildings and public transport. Health minister Ab Klink is also looking at extending the ban to cover hospitals and healthcare staff. The new legislation is expected to be ready by mid-2009.